Every three years, headquarters Air Force Jr ROTC (AFJROTC) visits each of the 878 AFJROTC units around the world. This past Monday, February 4, 2019, NC-931, Monroe/CATA AFJROTC, was inspected in 15 categories ranging from cadet knowledge to uniform inspection; from instructor program management to corps of cadet operations; from compliance to inventory. 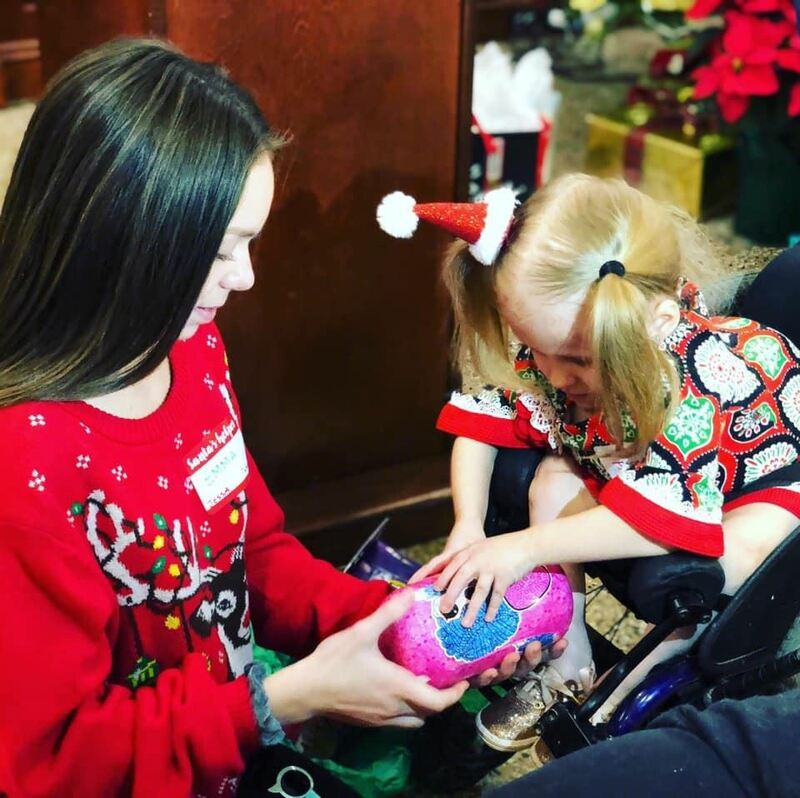 Last weekend on December 8, the “Hands Helping Others” club hosted their third annual Christmas Party for “A Chance to Dance” at Rolling Hills Country Club. 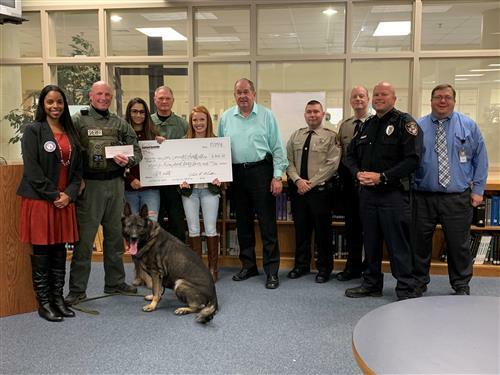 In early November Canine Club organized lunch time change collections to raise money for the Union County Sheriff’s Canine Unit to help purchase protective gear. CATA alum Tyler McKenzie has performed in the Broadway Hamilton and Mamma Mia stage productions and the Matilda the Musical national tour as well as the current 20-city national tour of the acclaimed hit Hamilton musical. Now, nearly 10 years after graduating from CATA, Tyler has returned to his alma mater to help guide the school's next generation of aspiring artists. October is Breast Cancer Awareness Month. The Hands Helping Others Club recently hosted a fundraiser during all lunch periods this month from October 9 to October 19th. On Thursday October 4th the Canine Club had two very special visitors from the Union County Sheriff’s Department as guest speakers. 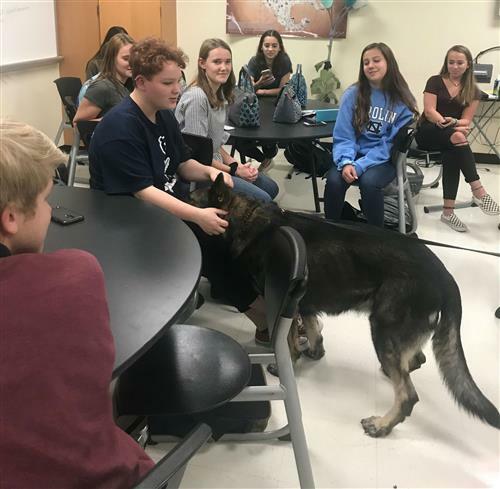 Deputy Summey and his patrol canine, Darko, came to the meeting to talk to students about training dogs to work with the Sheriff’s Department and how canine vests can be used to help protect the dogs. The Network Engineering students formed four teams to complete a network punch down lab. Each team was assigned to a patch panel and they required to punch down two ports. This would allow a PC to communicate with a device on the same port on another team’s patch panel. Ms. Gastreich's Health Science I class is learning anatomical positions. Students were given index cards and asked to label and place on their partner to identify the correct location. Students enjoy this type of collaborative learning. During the summer, the CATAlyst yearbook staff attended 2 summer camps. 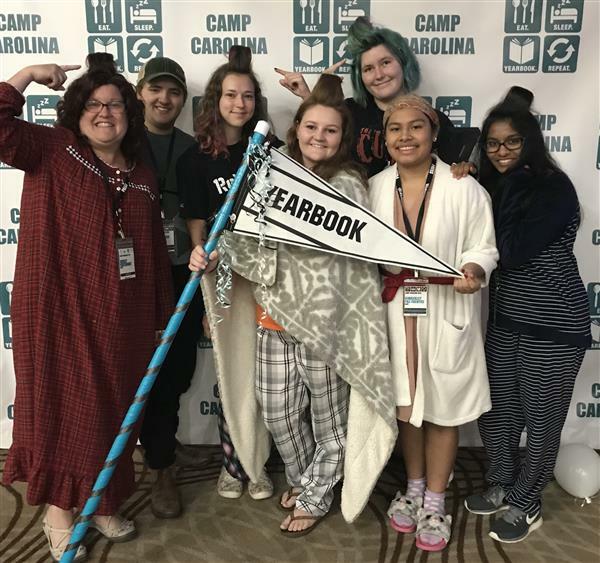 The first was held at CATA and led by the previous year editors where students learned the software used to create the yearbook. There was a time when Central Academy of Technology and Arts (CATA) senior Sam Jackson considered going to a traditional college or university. So he spent a few days with a friend who was enrolled at a nearby university to get a feel of what college life could be like. This past month, the CATA band had the pleasure to perform for a panel of judges at a Musical Performance Adjudication, or MPA as we call it. Although the performance was only one day, the amount of preparation we put into it was much, much more. The students have been practicing the music every day since the beginning of the semester. Some days we would stay after school to practice the music just so we could hear what it sounds like as a full band. 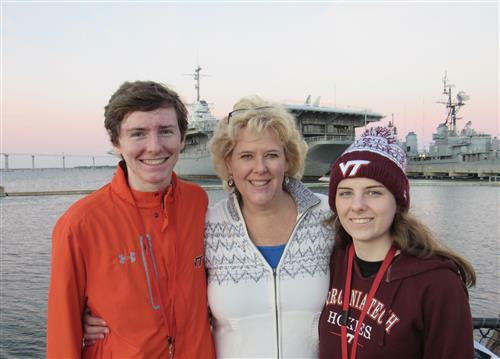 Mrs. Ann Helms is a parent at CATA who serves as a parent representative on our Site-based Management Team, as the treasurer for our PTSO, and as a team mom for our women’s and men’s tennis teams over the years. 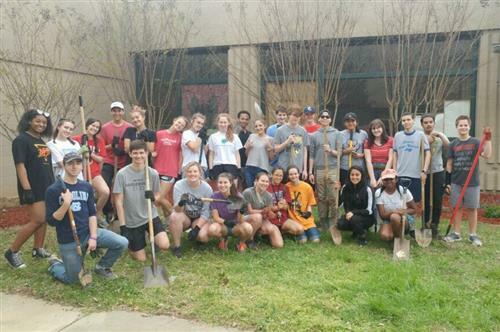 During Spring Break, 28 local students came together to plant a pollinator garden at CATA. Leafy green plants and colorful blooms now stand tall and ready to host pollinators in the garden. CATA’s Environmental Club partnered with Monroe’s Youth City Council to help create a memorable and useful garden. Housing more than 20 plants, on multiple beds, the group was able to completely transform a once stark landscape, into something beautiful. On Tuesday, April 24th, CATA juniors will take the SAT during the school day for free. Students have been reviewing for the SAT during their Cougar Time periods during the week. All students also have access to Khan Academy courses to help them prepare. Some students of the Pre-Engineering Academy, 31 juniors and 9 seniors, recently competed in the “Mini Civil Competition” at UNCC College of Engineering. The eight teams from CATA competed against twenty other teams from all around the Charlotte metro area. In Software Development and Game Design, students have the opportunity to learn the habits and skills needed to be successful in our technological and collaboration focused world. Students learn how to program, research and use each other as resources as they solve problems, build programs, and create various forms of media just as they would in the real world. To perform, record, and then edit a performance is a really neat experience. Most of the academy goes in blind having never touched a console or even plugging in a microphone, but it takes no time at all to get a handle on it. One of the greatest projects that we were able to work on in Electronics with Mr. Shear was the soldering project where each student was able to work on their own circuit board towards the end of the semester. The project itself wasn’t very complicated due to the fact that there were booklets with instructions on where to place each part along with bags of materials for each student. Sports Medicine is offered as part of the Medical Science Academy. Below are descriptions of two courses as well as quotes about the classes from current students. If you think you'd like to consider a career in Sports Medicine, apply to CATA! 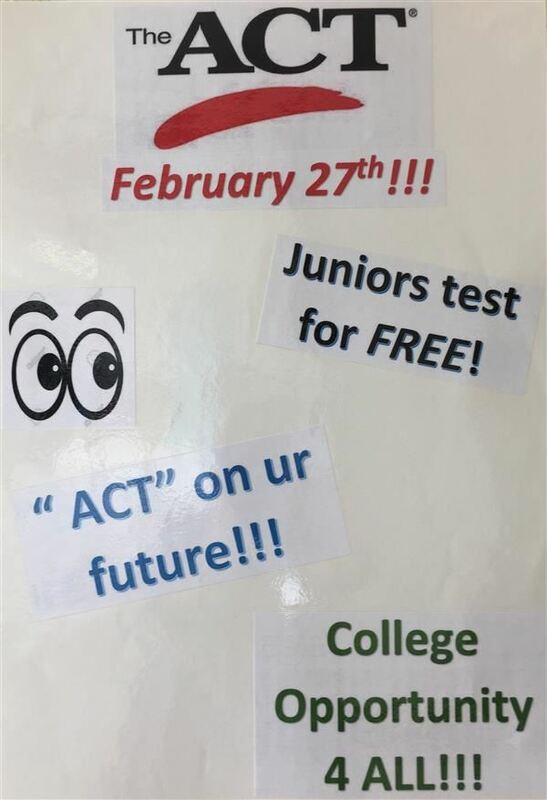 All juniors at CATA will be taking the ACT for free on Tuesday, February 27, 2018. CATA juniors have been participating in ACT prep during Cougar Time each week. During Cougar Time, students get lessons from CATA teachers on test taking strategies and help preparing for the content on the ACT. Do you enjoy working on cars as a hobby? Or would you like to know how to repair your own vehicle? Maybe you might be thinking about a career in the collision repair industry? Computer engineering is an academy that isn’t very hard. Once you go through the basics of IT, you learn about the hardware and software of basic computers, laptops, mobile devices and servers. Primary aim of the Dance department is to provide a nurturing and challenging program that equips students for involvement in the many facets within the dance discipline. Students entering our program receive a curriculum designed to provide them with a solid technical base while nurturing their creativity and their understanding of dance as an art form. The CATA Junior Cyber Security and Software / Game Design Academies visited Bank of America Corporate’s cybersecurity office, where they met with several of the bank's cybersecurity leaders. Students in the Medical Science Academy take a number of Project Lead the Way (PLTW) courses. Here is information and pictures from two of them. 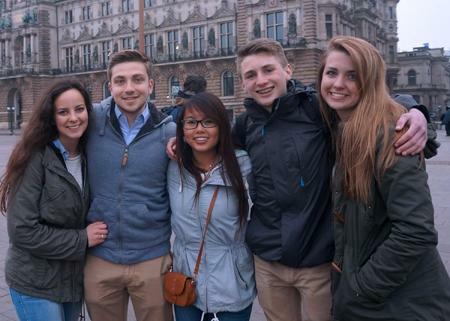 Students in Mr. Recher's Civil Engineering & Architecture (CEA) classes had two unique experiences recently. 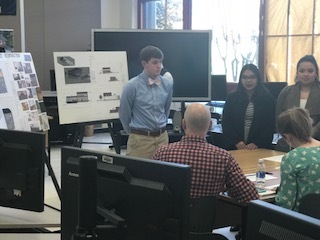 First, students presented their final design projects to a panel of (3) licensed professional engineers from the community. Are you considering a future in the automotive repair business or do you simply love cars and trucks? If so we have the program for you. Our Automotive Technology Program is one of the finest in the state. All of our instructors are certified by ASE and our classes are fully NATEF certified. We also have the finest of facilities created with the hands-on training students love in mind. Central Academy of Technology & Arts is a fantastic school filled with wonderful people who love, respect, and support each other. The academics are superb and it’s just a wonderful environment to be in. CATA theatre students took their performance of The Dark Road to the North Carolina Theatre Conference High School Play Festival November 16th and 17th. The show was a judge's choice winner at an earlier regional competition which allowed them to participate in the state festival. CATA has had a number of plays advance from the regional competitions to the state level and three shows have then gone on to compete at the Southeastern Theatre Conference High School Theatre Festival. Junior, Unique Perez, was selected by Blumenthal Performing Arts to participate in their Broadway Experience program in October. Unique spent three days in New York City experiencing Broadway and Off-Broadway Productions, meeting theatre professionals, and taking part in backstage tours of theatrical facilities. Way to go Unique!! Computer Engineering students recently spent class time building their 1st computer. Out of the 19 students in the class, only 4 had ever assembled a PC before. During these classes all the students were able to build and test a PC. Since the first of the year this class has covered all the basic parts of a PC and how they fit together and interact. CATA Dance Academy students participated in 5 different technique classes this past weekend at the Charlotte Ballet. Students watched Charlotte Ballet's Fall Works performance and performed themselves in the Evening Showcase. All 9-12th grade students began exploring College and Career Opportunities during Advisory this week. The tool, Family Connections, was utilized by Freshmen and Sophomores to take Strengths Explorer, which is an assessment to identify their talents and reveal their potential strengths. Juniors and Seniors participated in the SuperMatch College Search. This activity allows them to select from 23 criteria of what they are looking for in a college or university. We ask every parent to ask your child to show you their results in their Family Connections account. On Saturday, October 14, the Band of Blue traveled to Southview High School in Hope Mills, NC to participate in the first competition in the school’s history. We chose to go to a competition this year to push ourselves to a new level and have something to work towards at the end of the season. Southview’s Rumble in the Jungle was chosen, despite being three hours away, because it is where Mr. Jay Bolder, Assistant Band Director, taught for thirty one years before retiring. Mr. Bolder built the band program from the ground up, molding it into the amazing program it is today, and the Band of Blue wanted to honor that accomplishment by taking part in the competition he created. The Transportation Systems Academy Poster I (Auto Technology) won the inaugural Central Academy Homecoming Banner Contest. We want to thank everyone: Medical Science for their banner, Pre-Engineering for their two banners, Performing Arts for their 3-D Cake Banner, Transportation Systems for their second banner, and Information Technology for their banner. For the past two weeks students at Central Academy have been donating their extra change to help others! The student life organizations at CATA decided to join forces in order to raise money for the victims of Hurricane Harvey in Houston, Texas. Central Academy of Technology and Arts an A+ rated School! We are proud to share that Central Academy has been named an A+ school for the 2016-2017 school year! This is the third year in a row the school has earned the state’s highest distinction of A+, and the fourth year of earning an A. Only 87 schools in the state earned this designation for the 2016-2017 school year. This school year, Union County Public Schools (UCPS) parents will be able to view the real-time location of their child’s school bus on their smartphones, tablets or computers. Monroe- Eleven members of (MHS) Monroe High School and (CATA) Central Academy of Technology and Art’s Air Force (JROTC) Junior Reserve Officer Training Corps NC-931 attended Cadet Officer Leadership School at (FSU) Fayetteville State University, June 18-23. Cadets Hoa Le, Shayne Ackley, Francis Howell, Maria Adame, Brittany Staton, Daphne Contreras, Samuel Cox, Owen Bahasuan, Brayden Conley, Jennifer Silva, and Jose Jimenez, represented MHS and CATA’s AFJROTC program. Balancing High School studies and athletic excellence can be difficult, but CATA students do it with great success! CATA's Academy-based programs provide students with rigor in the classroom and our student-athletes are challenged twice over with meeting academic standards and participating in competitive athletic programs. No where is our academic success for athletes seen more than in the NCHSAA's Scholar Athlete program. In Spring 2017 six of our seven Varsity teams qualified as a NCHSAA Scholar Team. Phenomenal.That’s the word senior Justin Rivers used to describe his four years at Central Academy of Technology and Arts (CATA). He came to CATA from East Union Middle School and quickly made a name for himself as a promising student and actor. 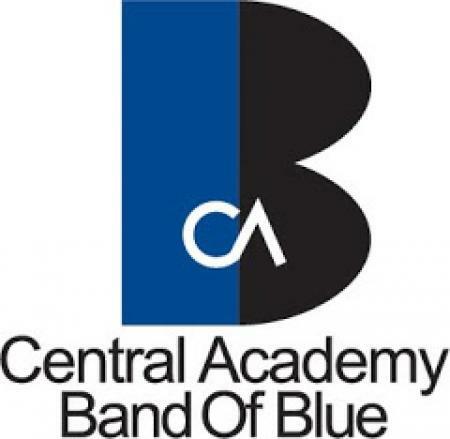 Central Academy of Technology and Arts Performing Arts Academies were nominated for 10 Blumey Awards! All Transportation Academy students attending Skills USA earned first and second place awards this year!! With the establishment of the MPRA Academy at CATA in 2015, the opportunity exists for students to be able to produce music and build the foundations needed to be successful in the recording industry and higher level of institution. Exciting course offerings such as Recording Arts I and II will be offered starting in the 2017-2018 school year. Dr. Fisenne personally congratulated and presented official Microsoft Certificates of Accomplishment to the following students for earning Microsoft Office Specialist Certifications for the Fall 16 Semester. This is a tremendous accomplishment that students and parents should be very proud of. Mr. Anderson’s English III class is “Celebrating Black History Month” by reading A Lesson Before Dying, by American author, Ernest Gaines. The lesson started by watching an interview with Ernest Gaines himself. Gaines wrote the novel based on things he witnessed in the 1940’s during his childhood. Gaines says that he wanted a novel “that talked about his people." The CATA Band Program is proud to offer students a traditional band experience within the academy setting complete with concert, marching and jazz ensembles that perform on a regular basis. The dance department is now home to 70 high school dancers. The goals of the department is to provide dancers with a solid technical base while nurturing their creativity and their understanding of dance as an art form. It is a goal of the Theatre Academy to prepare students for a career in as well as an on-going appreciation for the performing arts. While many of our students may not follow that career path, their study of the performing arts is intended to provide them with skills that will allow them to be successful in a variety of disciplines. As Central Academy of Technology and Arts begins preparations for the new semester, our Theatre Academy is preparing for the Southeastern Theatre Conference. We are receiving tremendous community support from both the school system and community groups. For numerous years the Union County Community Arts Council has supported the arts throughout Union County. From traveling theatre companies at elementary schools throughout the county to Arts in School grants, the Union County Community Arts Council develops a love for the arts in our youth. This year, as in years past, the UCCAC Board has voted to financially support CATA's participation in this national level theatre competition in Kentucky this March. In this experiment, Medical Science Academy students used bacterial transformation to insert the genetic information necessary to produce the desired protein into the bacterial cells. December is always a very busy month in the band program, and this one has been especially busy. Band students have been staying after school for combined dress rehearsals for the upcoming Winter Concert and Winter Collaborative, preparing for All-District Band auditions, preparing for their first ever entry for the Essential Ellington National Jazz Band Competition in NYC, attending honor band clinics and having to manage the strenuous course loads of any student at CATA. Most recently, the CATA Band of Blue and students in the Performing Arts Academy’s Jazz Class went to East Elementary School to take part in their Kindergarten Reading Celebration. Ms. Myra Rowell, SVP of Bank of America Corporate's Cybersecurity Department, along with two of her colleagues, spoke to Mrs. Bounds Foundations of Information Technology Class on Tuesday as a part of Union County Education Foundation BizEd Day. They shared their definition of Information Security (protecting information from unauthorized access, use, disclosure, disruption, modification, perusal, inspection, recording or destruction), the three principles of IS (confidentiality, integrity, and availability) and characteristics of an effective cybersecurity strategy (focus on early warnings, recruit and retain quality personnel, and continuous testing). At the NCTC Regional Play Festival at Pinecrest High School, CATA's performances won many awards. The group received a playwriting award for its production of Boal (pronounced Bo-All). Danny Morrison received an excellence in acting award and Emma Finnerty received the Outstanding Acting award for an actress. Mr. Larry Robinson received a directing award, and the show, Boal, was named Distinguished Play-Audience Choice. Environmental Class Works to Clean Bearskin Creek! On Thursday October 20th Ms. Kopchick, along with 40 of her students, set out to cleanse the environment at Bearskin Creek in Monroe. The day prior to the field trip, stormwater engineers from the City of Monroe visited Ms. Kopchick’s Earth and Environmental Science class. Students learned how agricultural practices affect our surface waters such as cows bathing in our rivers, and heavy rain washing sediment, debris and leaves into our fresh water. Central Academy of Technology & Arts has been named a 2016 National Blue Ribbon School. U.S. Secretary of Education John B. King, Jr. made the announcement today. This prestigious award recognizes high-performing public and non-public schools that are making great strides in education. Schools are honored for overall academic excellence or their progress in closing achievement gaps among student subgroups. City, School, and County Leaders joined students and staff at CATA to honor our Monroe PD and Monroe FD as we remembered 9-11 and honored our nation's fallen. Central Academy Students have started the school year off right! Academy classes, chromebook integration, and summer read sessions are all going well! Everyone at CATA is getting ready to start off the school year right! Get excited CATA Cougars!! During the week of July 11th, seven Student Council students went to a leadership workshop held at the Mars Hill University campus. This camp is offered for student council members across North Carolina in the hopes of bringing new ideas together. How do you compete and win on a national stage on Broadway all the while, keeping stage fright from taking control? Amina Faye, a 2016 graduate of Central Academy of Technology and the Arts, feels her attitude helped keep her nerves at bay, allowing her to give an award-winning performance. 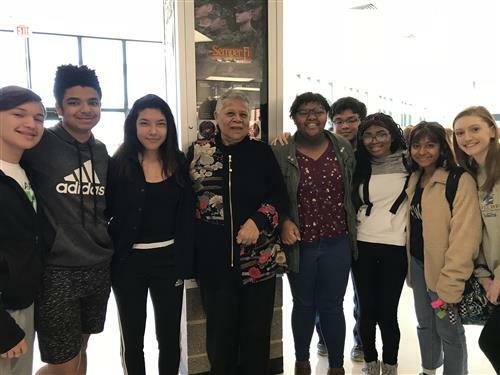 On May 17th and May 19th, the English II classes of Ms. Foreman and Dr. Tarlton had the opportunity to participate in a field trip to the Levine Jewish Community Center in Charlotte. During this field trip, the students had the pleasure of hearing a local Holocaust survivor, Irving Bienstock, speak about his experiences. Central Academy of Technology and Arts was nominated for awards in 12 of 12 Blumey Award Categories for their production of Ragtime. On May 22, 2016 CATA received four Blumey Awards at The 2016 Blumey Awards. Students from CATA's Collision Repair program placed in the top 5 at The NC State Skills USA Competition held April 19-21, 2016 in Greensboro, NC. Central Academy Performing Arts Take on New York!! Central Academy Performing Arts ventured up to New York, for a busy three day trip to the Big Apple. 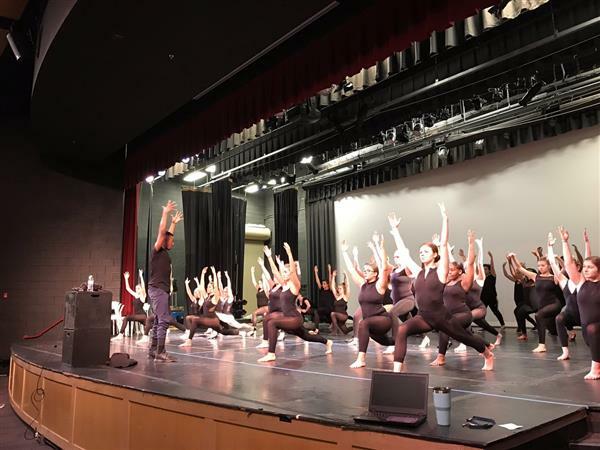 Students were treated to dance classes, a stage combat class, and a Broadway rehearsal with the dance captain from American in Paris. We visited several colleges including NYU Tish, AMDA, AADA, Marymount Manhattan, and Circle in the Square. Students also experienced talk backs with Silas Farley (NYCB dancer) , Brandon Ellis ( from ONCE), and the seniors sat in on a talk back with the cast of The Color Purple. Mario Röllig visited American History II and German II classes on Tuesday April 12, 2016. His interpreter said that he was taking English lessons but is still learning, so he delivered his story in German as a UNCC German Professor interpreted for the listeners. The 2nd Annual Robotics Challenge of Union County took place Saturday, April 16th at the SPCC Health & Technology Building in Monroe. There were 24 teams participating from Union County High Schools and SPCC, some representing local businesses. The Theatre Academy earned their way to the Southeastern Theatre Conference as representatives of North Carolina. The Diviner's cast and crew earned numerous individual awards, as well as earning Runner Up Best Show at SETC. CATA students had the opportunity to meet with colleges and programs to pursue a career in theatre. Interested Middle School students from around Union County attended Central Academy's CATA Crawl in March. Thanks to the fundraising efforts of the Central Academy of Technology & Arts (CATA) Parents, Teachers and Students Organization (PTSO) Performing Arts Committee and many generous donations from individuals, CATA was able to purchase the Debbie Watwood Memorial Piano. Students of Ms. Kopchick and Mr. Recher integrated a lesson on sustainability this week. Students were given topics on LEED, sustainable mining, sustainable wastewater management and sustainable waste management to research. They presented their findings by designing a poster and writing a position paper on why their topic was sustainable. The posters were created using handwritten engineering style lettering. CATA's performance of The Diviners at the NC Theatre Conference won them a trip to the Southeastern Theatre Conference (SETC) in March. The Southeastern Theatre Conference’s annual convention will be in Greensboro this year and CATA has been fortunate to receive donations from the Union County Arts Council, the City of Monroe, and many individuals to help lower the cost of the trip for the students. CATA students and staff dressed up in their football gear to celebrate the Carolina Panthers playing in the Super Bowl and to support the Souper Bowl of Caring's goal to help those who are hungry and in need. CATA Junior Kayli Tolleson won the UCPS District Poetry Out Loud competition on Thursday, January 28, 2016. The runner up was Michaela McDuffie from Weddington High School. Central Academy of Technology & Arts Honored at the 2015 NCTC High School Play Festival! The Theatre Department at Central Academy of Technology & Arts has much to celebrate, as they bring home honors from the 2015 NCTC High School Play Festival, held at Porter Ridge High School on November 7, 2015. Mrs. Bounds’ Foundation of Information classes visited UCPS Technology Services to culminate their learning of networks. Students have learned the physical devices that make up a network, the different types of networks, and how media is transmitted across a network. CATA Student Council members hauled out five tires, two shopping carts and 10 bags full of other trash and debris from Bearskin Creek in downtown Monroe on Saturday, October 17th. Many of the students chose to adorn waders and walk through the creek to pick up trash. Others remained on the banks assisting and cleaning the grounds around the creek. Dance Academy students participated in a Master Class with Lesli Todd. The sophomores and juniors participated in a jazz class, while the seniors were taught a jazz warm-up and contemporary combination. Ms. Todd focused on proper alignment and technique, while giving the dance students time to show off their styles. Master classes offer Dance Academy students the opportunity to receive diverse instruction within their dance curricula. 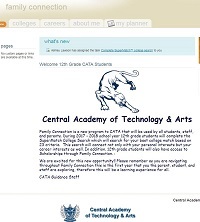 Central Academy of Technology & Arts has been busy for the past week preparing for students to return to school. School staff met by Academy and Departments to set goals for the year based on the Academy and Department Themes. 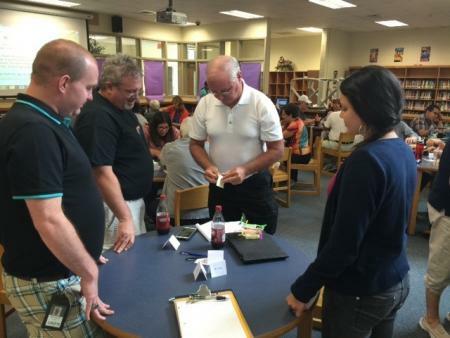 School staff participated in professional development on Safety, as well as Instruction to work toward ensuring that their classes center around: Challenging, Active, Teaching for learning, and engaging Atmospheres. The sad reality of history is that the further away it gets from us the less we tend to remember. Such is the case now with students and the atrocity of September 11, 2001. Most of our freshmen and sophomore students were infants, and some of them had not even been born yet. This is why we decided in English II to dedicate Friday, September 11, 2015 to the remembrance of those that lost their lives in that terrible attack on our country. Have you ever heard of Vogon poetry? It's the third worst poetry in the universe according to The Hitchhiker's Guide to the Galaxy by Douglas Adams. Students who read the book this summer then met as a group with Ms. Barron, Mrs. Eaton and Ms. Christensen to create their own examples of Vogon poetry. On April 24, 2015, the CATA “Hands Helping Others” Club acted as athletic buddies for the Special Olympics at Cuthbertson High School. The CATA band program eagerly welcomes Mr. Craig Retzlaff to the podium as our new band director!